...evolved women turning on their silver lining! Shining light on the beauty of the evolved woman, demystifying the stigma that grey equals dull! Dedication: Each single silver sister - many a new friend! 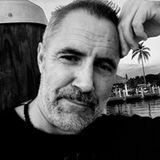 My friend Judi Schwarz for pushing me to get this out there, Tia Crystal for putting up with my initial chaos & rambling on about this project, and last but not least Tatiana Dudyez, my lady, assistant, and sounding board - thank you for holding space for me! Beauty is: - perception - radiance - yummy - contagious - reason to celebrate - to be acknowledged - subjective - in each and every one of us! - ATTITUDE! Faces of Silver, the project, started out fairly local up and down the U.S. east coast! Before I knew it I found myself in London, U.K. photographing Deba. Unstaged and ad hoc I was shown that she was about radiance and uncomplicated joy of life in the big city! Liz was part of a London group shoot we did crammed into one of London’s tiny hotels, with lots of charm and history we literally squeezed around in there, four of us, clothing, acessories and my equipment, the lot! One funny anecdote was that the rooms didn’t have numbers but had names after ‘themes’, ‘Goldfinger’ and co were about to be explored! This woman is a powerhouse trailblazing her path of individuality. Undoubtedly one of the leading faces of gorgeous silver hair she has the most distinct mane that flows in the wind like timeless strands of glitter. Yazemeenah, international model and equally amazing photographer leads life on her own terms - organic, healthy and authentic are but a few terms that come to mind watching her. Organic, especially to me, is the way she â&#x20AC;&#x2DC;seesâ&#x20AC;&#x2122; beauty in all its various forms. She works her designs and style in a one-of-a-kind form of presentation, fluid and natural, oftentimes in desert or ocean settings as a backdrop. My personal take from watching her short video clip creations in particular is her one of a kind ability to take the viewer into another world, to see beauty, nature and the feminine in an unknown, dream state like trail emphasizing the raw goddess like qualities in a unique, no BS way of existence... She has this special gift to make the simple appear mystical through her presentations of photography & fine art! I came to photograph Theonita in Los Angeles in February this year and found her to be tremendously inspiring. What precedes her persona is her smile that melts whatever gets in her way! She is a visual artist creating the most stunning paintings she has for sale. At our shoot she turned into this gentle being morphing into her surroundings seemingly comfortable whatever twisting maneuvers I got her into. She became one of my early cheerleaders for our â&#x20AC;&#x2DC;Faces of Silverâ&#x20AC;&#x2122; coffee table book project. Theonita spends her life helping others, sweetening their day with her distinct warmth & connecting personality! Jen organized our New York shoot. Lots of effort and coordination went into her putting this fun shoot together. We found an old train depot and with the help of the numerous spouses we made it an interesting and memorable shoot at and odd and interesting location! One hot Miami morning I met up with Hillary in the Wynwood arts district, who even though we sought shelter under big ceiling fans to keep cool, was a good sport about the sweltering makeup fighting heat and made it a very pleasant experience of hair blowing in the fans. So as sometimes things might seem not optimal some amazing results can result if weâ&#x20AC;&#x2122;re just open. let that silver glitter sparkle! Beauty - we have an entire industry catering to what ‘they’ think we ‘should’ be, ‘look’ like, ‘dress’ like and so much more. Standards and norms we try to fit into! Not trendy or changing, beauty is or is not! A move away from generalized ideas and part of a mass! I want to argue for a case of the opposite, of them tailoring their products and services to ‘US’! For way too long have they made us miserable in making us believe that we are not good enough if we are not X, Y, or Z. Let’s face it, how many people out there would love to be us? So if we look at yourselves in the mirror what do we face? A one of a kind masterpiece! This very industry should not, in my belief, make us think we need to be someone else, but ‘help’ us enhance what we already have, who we already are. We have unlearned to experience joy in simplicity, sanitized; take a toddler for example, it finds pleasure in what it sees, untainted by your or my subjective views of what beauty should ‘mean’! Exactly, beauty doesn’t mean anything! it simply is, if we allow to just take one step to either side and view things from a fresh perspective.Beauty, vibrance, and radiance, how are they attached to youth and then suddenly at some weird deadline have to be shed? Beauty not only applies to things alive but stones, the ocean, the sky etc. Through April’s shoot we discover that demeanor and a desire for expression can result in ‘silver mystique’! Surrender, belief, and imagination sometimes lead to realization of our dreams! ystique ...and then the tour moved on to downunder, Australia with Silverfox Management Agency providing the bulk of our silver models there! How does one end up in Zagreb, Croatia to shoot one of Europe’s most prominent models for ‘Faces of Silver’? Via London, Amsterdam, Munich and Vienna of course. To my surprise, driving from Austria to Croatia, I see Zvona smiling from billboard after billboard along the highway entering the capital! Little did I know that this trip starting out in Miami would result in some of the most epic imagery I have created. Never having been there I ask Zvona where we would shoot she says no problem, one of my best friend’s husband has a studio, he was the sole photographer of Mother Theresa back in the day and she, my friend, is the top celebrated fashion designer in Croatia! So I come to ready makeup a warm and set up studio almost guilty that I had to do nothing at all. It came together by itself, very fluid & organic. Zvona has returned to her roots in her home country after living all around the world, Italy, New York city, Canada... through a prospering career as a sought after model, nowadays with a distinct white mane! I am most fortunate to have met this beautiful down to earth ambassador for numerous charity and animal rights causes who has agreed to be part of the global ‘Faces of Silver’ project! Heike Where I grew up in the Austrian Alps we called someone who can’t sit still and is full of energy ‘mercury’ as they are constantly on the go and this is how I perceived Heike. Dropped in Melbourne, Australia on a chilly fall morning, this german immigrant showed me what goofing around combined with a serious face can result in during an ad hoc shoot outdoors in one of Melbourne’s beautiful parks by the river. Heike came through a collaboration with Australian ‘Silverfox Management Group’, a model agency geared for mature models. Her youthful spirit reminded me of Peter Pan, never wanting to grow up, yet in a beautiful woman’s form dancing through life with energy and zest open for anything fun around the next corner. 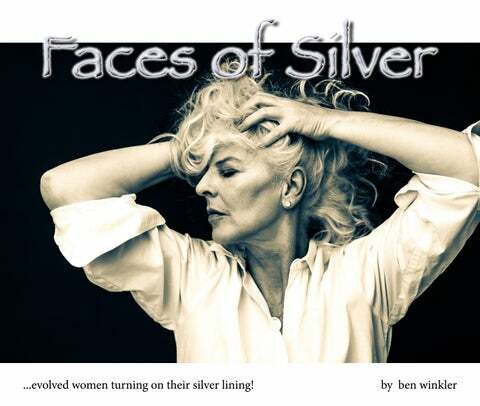 A two year global project featuring the beauty & radiance of gray haired women and their manes!